When it comes to keeping your family and home safe, making sure your household electrics are working properly is important. If you believe you have an electrical problem in your home, it’s best to identify the problem quickly to avoid serious health hazards. Here are 5 signs you have an electrical problem and how you can resolve them. Do you find that some of the lights in your house are too bright, but others aren’t bright enough? This is a common issue and can be the direct result of an electrical problem with your main neutral connection. The best way to know for sure is to check all of your lightbulbs. If some of your bulbs have a different wattage, this could be causing the issue and is easily fixable. If your bulbs are all the same wattage but you’re still experiencing a difference in the light output, it’s more than likely that there is an electrical problem with the main neutral connection which will need fixing by a trained professional. If you find that your light switches aren’t working properly, this could be a sign you have an electrical problem in your home. Some light switches may have been installed badly or be a cheap product. If you’ve been in your home for a while and know that your light switches are of good quality, it could be a sign that a fault has developed in the wiring of your light switch. If you have just moved into a new house and don’t know the details of how old your light switches are, it’s best to call an electrician to inspect the fixtures. 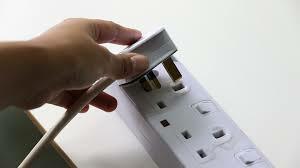 A faulty outlet or circuit can be identified quickly and easily by a professional. An unexpectedly high electric bill can be caused by a few electrical problems in your home, but it’s best to check with your electricity provider before seeking professional assistance. Make sure the unexpected bill is accurate and that your provider hasn’t charged you incorrectly. Once you are sure the electric bill is correct and you definitely haven’t used this much electricity, it’s time to call an electrician. If an electrical device in your home has an electrical fault it may well be causing power surges in your home, hiking your bill up. Damaged or worn out wiring can also cause expensive electrical surges which will need to be checked and replaced by a licensed electrician. Electric shocks aren’t fun for anyone. No matter how small the shock is, any kind of shock can be a sign of an electrical problem and potential danger to you and your family. Shocks happen most often when an electrical device is switched on or turned off, meaning it could simply be a fault in the device itself rather than your electrical system. However, if you find yourself getting multiple shocks from appliances or devices plugged into the same socket, or more than one socket, this is a sign of an electrical problem that will need professional assistance to rectify. It’s always safer to speak to an electrician when in doubt. A circuit breaker is designed to protect your home, so frequent trips are good in a way. It indicates that the circuit breaker is doing its job in protecting you from harm. Unfortunately, it also indicates that electrical surges are happening often which is a bad sign and indicates a more serious electrical problem. It’s worth taking note of what kind of devices and appliances are being used when circuit trips are happening in your home. High wattage appliances like microwaves and hair dryers are common culprits. If you find that a particular device or appliance is causing an electrical problem, replace the item asap. If you find that the circuit continues to trip even after replacing a suspect item, this could be a sign that there’s a fault in your circuit breaker or electrical wiring. What Can You Do ABout Electrical Problems? If you identify any of these electrical problems in your home, it may be time to contact an electrician. Ongoing electrical problems are a sign that your home may not be safe. Get in touch with a professional electricians, like First Strike Electrical, to help diagnose problems and find solutions. For peace of mind, we can ensure your safety and keep your home in good working order. Give us a call on 0203 633 4536 or fill out our online contact form and a member of the team will get in touch as soon as possible to help you.